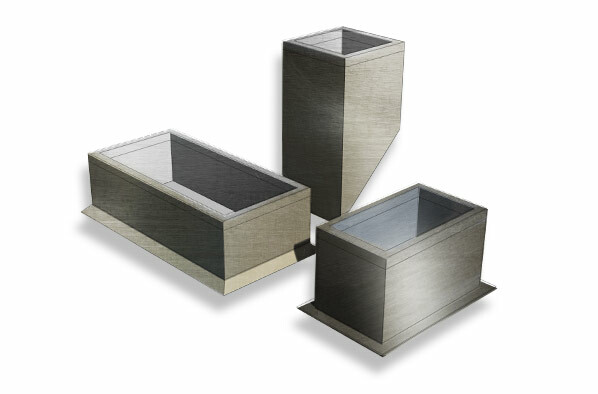 Standard roof curbs are manufactured of galvanized steel with continuously welded seams and mitered corners providing air and water tight construction. Internally reinforced as needed for proper equipment support. Fully insulated with 1 ½” thick 3# density fiberglass. Wood nailer and gasket where applicable. For non-insulated roof decks with a fully mitered 3” cant. Curb will be flashed. For insulated roof decks with a fully mitered 3” cant and step to match deck insulation thickness. Standard step is 2”. Self-flashing with gasket. Curb will be “mopped” in as opposed to flashed. For single-ply roofing where no cant or step is required. 90° flange configuration.